LAS VEGAS - Former Vegas Mayor Jan Jones is currently the Senior Vice President of Communications and Government Relations for Harrah's Entertainment, Inc. Last Thursday, Jones' photo appeared on the front page of the Las Vegas Review-Journal for reasons Harrah's would never condone. 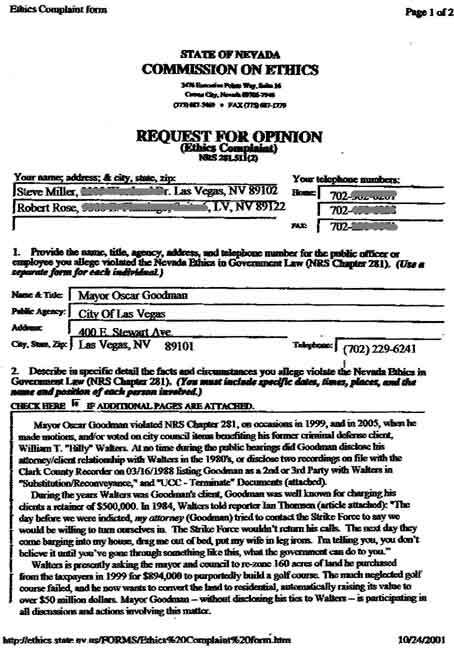 A previously withheld document published in the LV Review-Journal showed that she may have interfered with an internal city inquiry that would have put the breaks on a sweetheart deal designed to make Billy Walters -- one of her closest friends -- tens of millions of dollars at taxpayer expense. For the past seven years, it seems that entire departments of Las Vegas City Hall have been busy doing the bidding of one golf course developer. Giving him special rates on his water; letting him buy city land for pennies on the dollar; letting him use city land for no compensation; providing him inside information so he can outbid competitors; and most important, placing phony restrictions on the dissemination of public records to keep law enforcement and reporters at bay. The revelation came after months of city hall stonewalling based on the phony premise that communications between elected and appointed public officials, if copied to the city attorney, are protected by "attorney-client privilege." Only a savvy attorney such as Sin City's current mayor, former mob lawyer Oscar Goodman, could have conjured up such a scheme to keep the public in the dark. "Today is a sad day from a lawyer's perspective." "The attorney-client privilege should be forever," whined Mayor Goodman after media outrage and good lawyering forced him and his obedient council to consider waiving the purported "privilege," and release a truck load of damning documents to the public and stalled off investigators from the Nevada Department of Justice. He complained the media will "take this opportunity to cast aspersions and try to destroy the reputation of people referenced. That is cowardly, that is yellow journalism. I believe it's a cheap shot. And whoever reads the drivel should take into consideration the source of the drivel." Goodman said this moments before last Wednesday's vote to lift the veil of secrecy surrounding the taxpayer funded enriching of his former client, Billy Walters, and after a career spent putting down law enforcement agencies. Last summer, LV Metro Police found criminal wrongdoing by city staff to benefit Walters, and the Clark County DA refused to prosecute claiming the statute of limitations had expired. Nevada Attorney General George Chanos smelled a rat, and took over the case from the recalcitrant DA. Last Wednesday, Goodman inadvertently compared city elected officials and bureaucrats to his former murderous clients who he protected through "attorney-client privilege," when he called the privilege "sacrosanct." Then his stooge, City Attorney Brad Jerbic, tried to put the lid back on when reporters asked for the previously withheld documents. Goodman was the mouthpiece for many of the most dangerous criminals in our country's history. He was well respected among his Mafia clients for keeping his mouth shut, and last Wednesday he tried to apply the same criminal defense standards to withhold public information -- a real rotten apples and oranges stretch of logic he probably thought he could get away with because of his pseudo popularity. Goodman and his city attorney knowingly withheld information needed by the AG to complete the investigation by claiming a privilege that does not belong in city government. When I was at city hall, EVERYTHING was public information. NOTHING in city government has ever been considered "privileged" information. LV City hall is not the CIA, or a criminal court trial. 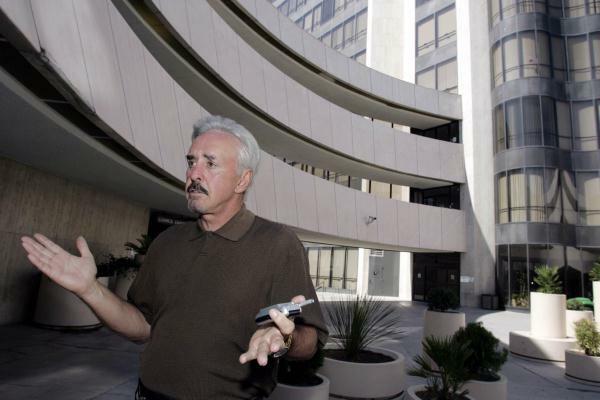 Its governed by and for the citizens of our city, not Billy Walters, Jan Jones, and Oscar Goodman. Its obvious they think the public is really stupid, and their "attorney-client privilege" claim proved it. The following council items were an insult to the public's intelligence. When things began to look bleak for Goodman after his previously secret documents appeared on the KLAS TV News website, and RJ, an unexpected knight in shining armor raced in to protect him. Goodman was once Billy Walters' criminal defense attorney and accepted hundreds of thousands of dollars in legal fees secured by Walters' LV Country Club home, so its easy to see through Goodman's protective position -- and conflict of interest. 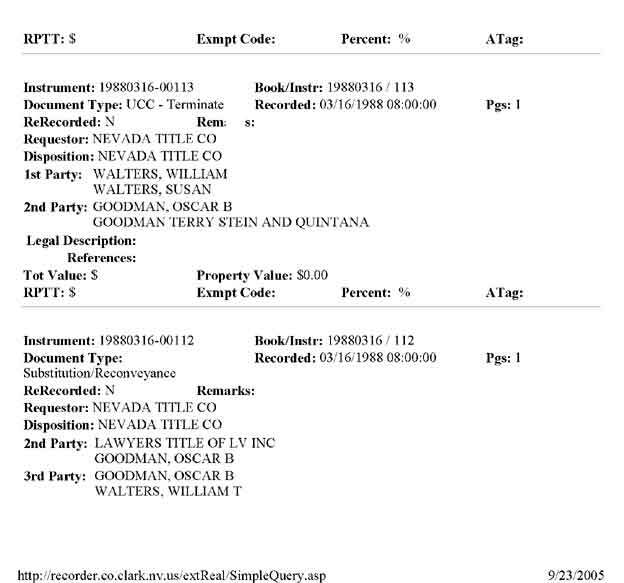 However, Walters also has another protector in the form of Brian Greenspun, the Editor of the Las Vegas Sun. Greenspun is partners with Walters in the Wild Horse golf course. On February 23, Greenspun published an amazing Editorial in support of his partner. Earlier that month he funded a skewed "independent study" showing everything Walters does is good for the taxpayers. Goodman conveniently jumped at the chance of using this "independent study" to hammer his critics. "We knew we were doing the right thing for the taxpayers, so it's good that an independent study has confirmed that fact." "I hope this will serve to promote the people's trust in the City Council and the belief that we continue to act in their best interests," Goodman told the SUN on Feb.19. Billy Walters wants to build thousands of low end houses on land that was deed restricted to be a golf course purposely located next to the city sewer plant to buffer odors. Goodman is now trying to promote Walters' plan to build what is sometimes referred to as "Honey Pot Estates." To do so, the deed restriction would have to be lifted, and Goodman was poised to do so until the AG stepped in. This week, Goodman's predecessor Jan Jones and her stooge former Councilman Michael McDonald were flushed into the mix when the "attorney-client privilege" ploy splashed back in Goodman's face. Meanwhile, KLAS TV's, and RJ city hall reporter David McGrath Schwartz' in depth coverage of this story has caught Jones, McDonald, Goodman, and Greenspun in an evaporation pond of their own making, and all the spin doctors in Nevada can't mask the smell as they swirl round and round looking for a way out.